Making half of the universe. Posted on May 13, 2014 by F.H. I am giving my Year 4 students the opportunity to have their own Genius Hour this term. It really made me wonder how far our students would be willing to go if we didn’t stand in their way and stop them. If we didn’t bombard them with rules, guidelines and curriculum necessities. If we didn’t breathe down their necks saying, “No, we don’t have time for that because you have to get that narrative published before lunchtime”. 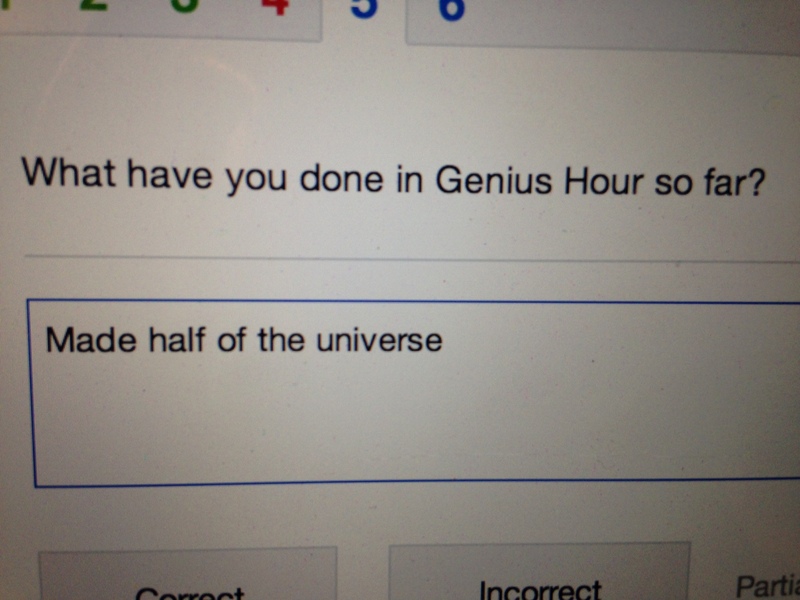 Seriously, one of my students has told me that he has made half the universe. He’s only partly joking, as his Genius Hour project is an investigation of the solar system, but he is thinking big picture! He knows that things like this are possible! I’ve got other students who have decided to create their own blog, one is writing her own recipe book and another is trying to see if he can power a lightbulb using a potato. Technology is evident in all we do and one day, it may even see some of our students making half (or more!) of the universe.